Dorinda’s debut novel, ‘Heronfield’, was published in September 2012. Tony, a young man barely in his twenties who experiences the horror of Britain’s first defeat and offers his unique talents to the war effort, only to find that his secret work threatens his relationships with those he loves. David, Tony’s elder brother, fighter pilot and hero of the Battle of Britain. Sarah, whose work with the VAD’s brings her into contact with so many, forcing her to choose between a man with loyalty and honour or another with all the characteristics of a coward. Bobby, a young American GI for whom a posting to England brings love and hope. And at the centre of it all, Heronfield, the manor house set amongst the gentle rolling downs of southern England, one time home for Tony and his family and now a war-time hospital. Heronfield sample You can find the first chapter of Heronfield here. …The course of six years is spanned, from the beaches at Dunkirk to the liberation of the concentration camps. Many of the chapters have beginnings that are akin to the Pathé News segments, telling what is happening in other areas of the world before returning to the main action in either Heronfield or St Nazaire – a brilliant way of giving the reader all the information required. The characters are incredibly realistic; it is difficult to set Heronfield down. It would not be possible to write a story about the bravery of the soldiers or the Resistance without making sure that the reader is aware of just why they were so brave, and this is put across tactfully, but still gives the reader an idea of the horrors faced by these people. An amazing read. 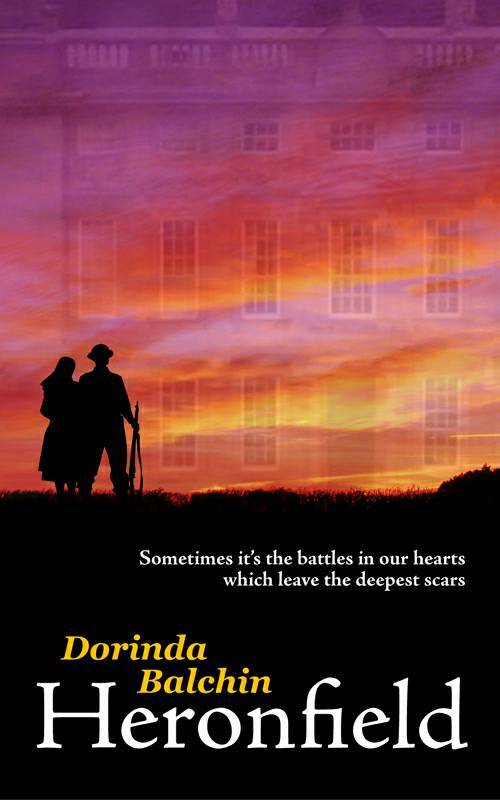 …Heronfield by Dorinda Balchin is a six-year saga set in England during World War II. It is a fantastic story that put me on the battlefield and into the lives of brothers Tony and David, their friends, family and loved ones…What a wonderful book this is. Dorinda Balchin wrote four hundred and ninety pages of an excellent story. It took me longer than I expected to read it, but each page made me cry, cheer, smile, and anxiously await D-Day and the end of the war. Heronfield is a fictional story with accurate historical events that made for a superb book. I cannot recommend it highly enough, especially if you enjoy family sagas and World War II history because it combines these elements in an incredibly good read. Reviews If you enjoyed reading ‘Heronfield’ (and even if you didn’t!) please leave a review here. Constructive comments will help me to write more books that will appeal to you. Thank you. ‘Heronfield’ grew out of my love for history, and as such I have tried to remain true to the historical facts whilst peopling my novel with characters with whom my readers can identify with all their human strengths and weaknesses. These characters serve to bring together some of the key moments of the Second World War which I have described as accurately as possible. From the beaches of Dunkirk through the bombing of Coventry, the work of the VAD’s and the Special Operations Executive I have remained true to historical fact whilst allowing some flexibility to enhance the flow of my story. Thus the activities of 74 Squadron are accurate, their bases and number of losses a matter of record; the same applies to the 1st Infantry Division and the two Ranger Battalions of Force O which landed on the Normandy beaches, and the liberation of the concentration camps. On one occasion only have I deliberately strayed from recorded fact – the submarine pens of Saint Nazaire. Soon after the surrender of the French in June 1940 the Germans built a heavily fortified U-boat base in Saint Nazaire, its 9m thick concrete ceiling capable of withstanding almost any bomb in use at the time. In 1942 611 British Commandos and Naval personnel launched a raid against the docks, destroying the gates and machinery so that the U-boat pens could not be used for the remainder of the war. 89 decorations were awarded to those who took part in the raid, including 5 Victoria Crosses, and the exploits of these men are deserving of a book of their own. In ‘Heronfiled’ I needed the character of Tony Kemshall to be working either alone or in a small group and so had him searching for and finding submarine pens hidden in a cliff face. My deviation from historical fact on this point is in no way meant to be at the cost of the memory of those brave men who took part in ‘Operation Chariot’. Pingback: Cover artwork now in print | Lorna Gray.